Rockhampton Cricket Club is one of the oldest institutions in the village. The exact date of it’s foundation is uncertain but historians believe it to have been sometime about or before 1872. At that period England was cricket ‘mad’; thousands of people up and down the country would spend their half-day off on saturday afternoons playing or watching the game. Inspired by the feats of the young W.G. Grace, many local Gloucestershire teams were born. Thomas Jenkins Ford of Court Farm was the great enthusiast of our village. He became the founder and first captain of the Rockhampton Cricket Club. Amongst the players who turned out for their parish side in those days we find a host of familiar names. There was: Ford, Jenner-Fust, Cullimore, Coates, Malpass, Pegler, Bendall, Ponting, Boulton, Smith, Pinnel and Ind. This would have been grass-roots cricket at it’s most basic. The playing area would have been considerably smaller than it is today with Withy trees and marshy patches scattered around it. The most usual method of keeping the grass short enough to play on was to let the local sheep loose upon it and no doubt there was often larger livestock leaving it’s mark upon it too. The players, of which there were not necessarily always eleven, would have worn heavy working boots, light-coloured working clothes and their favourite hats or caps. Matches, which were popular events for the whole village to attend, were often of two innings per side. They played against other local village and estate teams, with whom rivalry would have been intense. Opposition for Rockhampton was provided by the likes of: Hill, Tortworth Park, Falfield, Oldbury, Tytherington, Eastwood Park, Old Down House, Berkeley and Dursley. In the summer of 1880, Mr Herbert Jenner-Fust played for Hill against Rockhampton at the ripe old age of 74. He captained his side, bowled unchanged from one end, kept wicket at the other and batted with the aid of another player to do the running for him, and with a bat which was made in 1829. Six years later in 1886, the Rockhampton bowlers had their greatest day when they dismissed the Sharpness side for just one run. And that run was a wide! Sid Malpass recorded figures of 7 for 0. 1892. The cricket club was forced to draw stumps temporarily. The loss of key players and the subsequent lack of success had seen enthusiasm wane dramatically. No doubt it was assumed that it would all start up again in a few years time. 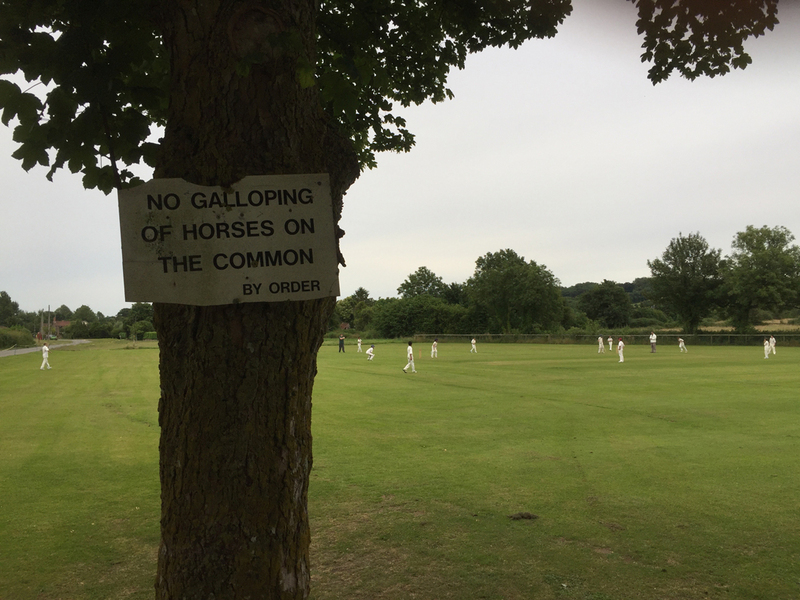 In fact the village had to wait for forty years for the common to be used for cricket again. In the meantime a ladies hockey team briefly flourished on the common. 1932. Rochampton and Hill Cricket Club was re-established. With the help of a scythe, a mowing machine and a larget concrete roller, three young villagers, Bert Gough, Frank Child and Francis Ind, spent many hours getting spent may hours getting the ground back into shape. A small shed was built in the paddock across the road to hold the equipment and a fence put around the pitch as protection. Scores were posted on the tree in the corner of the pitch and teas were provided by Mrs Child in Green Farm. For away fixtures of the usual mode of transport was by bicycle, with various bits of kit strapped to the handlebars. One can only imagine what a dangerous procession they must have formed on the way home. Between 1939 and 1946, no cricket was played on the Common. The Second World War had removed most of the players and concentrated other’s minds on more serious matters. Once peace was restored the Cricket soon resumed. It was still very much a village side. The locals and occasional guests within the team would have widely different abilities and ages. The club colours were chosen as musk-yellow and white, in honour of the Berkeley Hunt, of which Bert Gough was a very keen follower. It was not until 1948 that John Lanham scored the first recorded 50 for the club. In the same year John Pritchard took nine wickets against Wotton. But Rockhampton did not have everything it’s own way. It also recorded it’s lowest ever score. Dismissed for 4 by Dursley Seconds. 1952 Rockhampton suffered it’s worst season. • Played 22, lost 20. 1956 Teas were being taken in the village hall, but most of the honours continued to be taken by the opposition. The famously short-sighted John Tully was both Captain and Wicket Keeper. Between 1953-1967 he was captain for eleven seasons and vice-captain for the other three. 1963. A wooden pavillion was built in it’s present position on the common. Scores were now posted on the picket fence outside. The teas were taken inside. 1965. The withy trees and long grass that for so long had intruded onto the outfield were finally removed. A fence, to stop the balls from disappearing quite so easily into the rhine that formed the boundary, was erected about the same time. Players still turned up for matches already dressed to play, but they did so now in cars and from further afield. 1968. The first end of season Presentation Dinner was held. It was decided to award an annual Clubman of the Year trophy. The inaugural winner was Mike Savery. 1969. The Committee laid aside it’s religious reservations and agreed that cricket matches could be played on Sundays for the first time. D. Walters scored the first century for Rockhampton and the team total passed 200 for the first time. 1971. Brian Cullimore of Yew Tree Farm was elected President of the Club. Playing strength and numbers had undergone a slight decline in the previous couple of years. The club needed to change to attract more members. 1982. The Pavillion was extended to include toilets, proper changing rooms and showers. A licensed bar was opened and subs increased to £7.50. The first club cricket tour was organised; a weekend in Worthing. 1983. Rockhampton entered a team in the Stroud League, Division 4. To accommodate increased membership a second team was started up. Both playing and social membership was on the up. As well as cricket, darts and cribbage teams were formed. 1983. Centenary Celebrations were held (13 years late!). The main event was a match against Gloucestershire C.C. XI, featuring Jack Russell, Bill Athey, Kevin Curran, Tony Wright and David Graveny. A six-a-side competition was held for local clubs. • The Second XI joined Stroud League Division 6. • The First XI won Division 4 and promotion. • An extension was built onto the pavillion to provide new toilets and a larger lounge area. Fitted seating was also installed. 1986. The first Youth team was started at Under-18 level. Jim Salt scored a record 185 not out v Mangotsfield, including 15 sixes. In the same match, Rockhampton totalled over 300 for the first time. Richard Jones became the first player to score 500 runs and take 50 wickets in one season. 1987. Bert Gough stepped down as Club Chairman after 50 years of service. 1988. The concrete practice net was built. Terry Fletcher and Colin Houghton shared a record partnership of 260 v Rangeworthy. 1989. The First XI won Stroud Division 3 and promotion. 1990. An extension to the changing room was built. 1991. The Under 17 and Under 15 teams joined the Bristol Youth League. 1992. A Third XI was formed and entered into Stroud Division 6. 1994. The First XI won Stroud League Division 1 for the first time. 1995. The Club purchased the Boundary field for £13,000 in order to develop a larger second pitch. The field was drained and appropriate grass sown. 1996. First and Second XI’s were accepted into the new GCA County League. The first game of cricket was played on the uneven Boundary Field pitch. Irvin Gale became the first player to score a double hundred for the club. His 215 v Westbury on Severn was made at the Boundary Field. The Sports Council awarded the Club a grant of £85,000 towards the development of the new ground including a new pavillion, machinery, car park and services. The project to build the new pavillion (designed by architect John Evans) was overseen by Alec Hurley. The main contractor was Geoff Fisher of GAP Supplies, Thornbury. 1997. Work began on the foundations of the new pavillion, the drive and car park. Over the winter, the square and parts of the outfield had soil added to try and fill the hollows. Two portacabins were acquired to act as temporary changing rooms on site. A mains water supply was piped on. • In the autumn, the Club President Brian Cullimore sadly passed away. 1998. By the start of the season, the basic shell of the building had been completed with cold water and one toilet available. Showers still needed to be taken at the old pavillion. Further work on the pitch had largely flattened the square and greatly improved the outfield. 1999. The new pavillion at the Boundary Field was completed. It was officially opened by David Passmore, Sports Presenter of BBC West, at the start of a week of celebrations. 2000. First XI Relegated from County League 1, Player of the Year – Tom Nichols. 2001. First XI Relegated From County League 2, Player of the Year – Mark Burberry. 2002. County League 3 Winners, Matt Tyler 505 runs and 23 wickets (1st XI), 3rd X1 Lowest League Total 29 all out v Minchinhampton, Player of the Year – Matt Tyler/Jon Wells. Will Tyler’s U17 side inspired by Liam Rinn and Adrian Savery win the Cup at The County Ground. Rockhampton win the annual Sixes competition. 2003. County League 2 Winners, 2nd XI County League 1 Winners, Player of the Year – James Hancox. 2004. County League 1 Winners, Player of the Year – Mike Fletcher. 2005. 2nd XI Glos/Wilts League 2 Winners, 2nd XI Highest League Total 357-4 v Marlborough , Player of the Year – Jon Wells. 2006. Simon Hore appointed 1st XI Captain, First XI Second Highest League Total 361-2 v Hinton Charterhouse. James Hancox record 35 wickets in a season (First XI), Player of the Year – Simon Hore. 2007. Gloucestershire League Champions, GT Sports Sunday Cup Winners, Richard Jones 7-38 v Redmarley (First XI). Player of the Year – Will Tyler. 2008 – Midweek SDCA Senior Cup Winners, Will Tyler 147 v Glos City Winget (First XI), James Hancox record 37 wickets in a season (First XI). 2nd XI Lowest League Total 31 all out v Wotton Bassett, 3rd XI Highest League Total 292-4 v Wickwar. Player of the Year – James Hancox. 2009. 3rd XI SDCA Division 1 Winners (Richard Mackinnon – Captain), Covers built for Boundary Field, Boundary Field extended, First Septemberfest Music Festival, Clubmark Status achieved, Player of the Year – Jack Spence. 2010. Matt Tyler appointed 1st XI Captain, 4th XI Entered into Stroud League (Mike Fletcher – Captain), Jeremy White passes 10,000 runs for First XI, Focus Club Status achieved, Player of the Year – Dave Hill. 2011. James Hancox appointed 1st XI Captain, RCC v Lashings World XI, 4th XI achieve promotion place finish in Inaugural Season (Ian Williams – Captain), Alex Macdonald scores first female League fifty (4th XI), Player of the Year – Alastair Douds. 2017. RCC runs 4 teams on a Saturday at its 2 grounds, the 1st XI plays in WEPL Premier 2 Glos/Wilts, the 2nd tier of cricket in the South West.